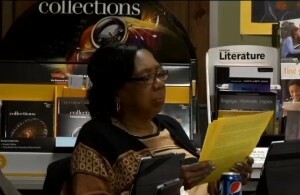 FLORENCE, S.C. — A school board member in South Carolina is refusing to stop praying out loud at public meetings, noting that she is on a mission to put God back in schools. Secretary Pat Gibson Hye-Moore is a part of the “Put Prayer Back” initiative, and desires to see public invocations restored across the nation. She prays aloud at each Florence One School Board meeting. But some have now taken issue with Hye-Moore’s prayers and are questioning whether the practice is legal. The board of trustees is contemplating whether to discontinue the board’s moment of silence from the agenda in order to stop Hye-Moore from praying out loud. “The first thing that happens is that we take an oath of office to uphold and support the Constitution of the state of South Carolina and the Constitution of the United States,” Chairman Porter Steward told reporters. The matter was discussed on Thursday during the Florence One School Board meeting. The attorney for the board spoke to those present about the concerns, but also noted that the United States Supreme Court is currently considering a similar matter in regard to public prayers at town hall gatherings. As previously reported, the court accepted the case of Town of Greece v. Galloway last May, a legal challenge that centers on the invocations that are offered at town hall meetings in Greece, New York, just outside of Rochester. Local residents Susan Galloway and Linda Stephens are contending in the suit that the prayers made them feel “marginalized” as they are not followers of the Christian faith. Galloway is Jewish and Stephens is an atheist. Because the Supreme Court has yet to rule on the matter, the Florence One School Board decided to hold off on any action until the case is decided. However, Hye-Moore said that even if the court rules adversely, she will not stop praying at school board meetings and glorifying Christ. As previously reported, a city councilman in Cuyahoga Falls, Ohio is similarly refusing to stop praying in Jesus’ name despite complaints and demands from a prominent atheist activist organization. “If I, as a Christian, am embarrassed to share His name, then He is going to be embarrassed in recognizing me in my relationship with Him,” declared Councilman Terry Mader earlier this month. According to the Cuyahoga Falls News Press, Mader said that his relationship with Christ is more important than the offense that men might have at the mention of His name. He outlined that some have counseled him to stop invoking the name of Jesus, but he has declined to do so.